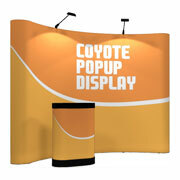 Pop up displays are easy to ship and carry, quick to set up and simple to accessorize. 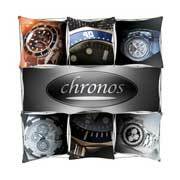 They're ideal for frequent exhibiting at trade shows and conventions, or simply as a retail display that can't be missed. These are some of today's top brands of portable pop up displays, available in many shapes, sizes and ready-to-go packages. If you have any questions about choosing the right pop up display for your marketing needs please call us toll free at 1-855-536-3385 or contact us by email. The first choice for thousands of new and experienced exhibitors alike, this pop up system made in the USA and backed by a Lifetime Warranty. 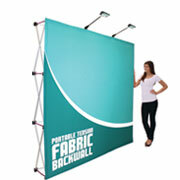 With tension fabric graphics that stay on the frame, popping these backdrops up couldn't be simpler for set up. A strong, dependable system with a sturdy frame, and several graphic and accessory options to choose from. 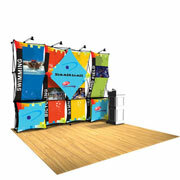 Eye-catching 3-dimensional fabric displays available in 29 creative and different configurations. 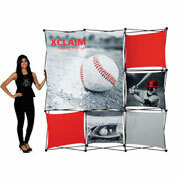 Premium tension fabric displays that use pop up frames to create eye-catching, 3-dimensional presentations of beautifully printed fabrics. 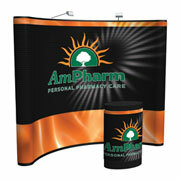 An economical choice for this type display, with easily swappable tension fabric graphics for future presentations.